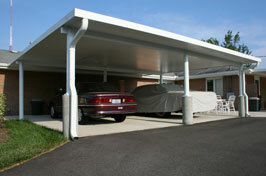 Mike Sikora’s carports provide lasting protection for your vehicles. Strong enough to withstand baseball-sized hail and small branches, they are also aesthetically pleasing. Carports come in a variety of styles and colors and, as with any Dayton Home Improvement project, are custom installed by quality craftsmen. Give your car a fighting chance in the battle against sun, rain and snow. Learn more about our carports today. Our aluminum awning systems are a great way to protect against excessive fading and U.V. deterioration of your home’s furnishings and carpet. While providing great curb appeal, they are also Earth-friendly. Dayton Home Improvement awnings can also be custom fit to help protect your home’s entries, patios, and commercial storefronts from harsh elements. Fight back against sun, rain and snow. Learn more about our awnings today.